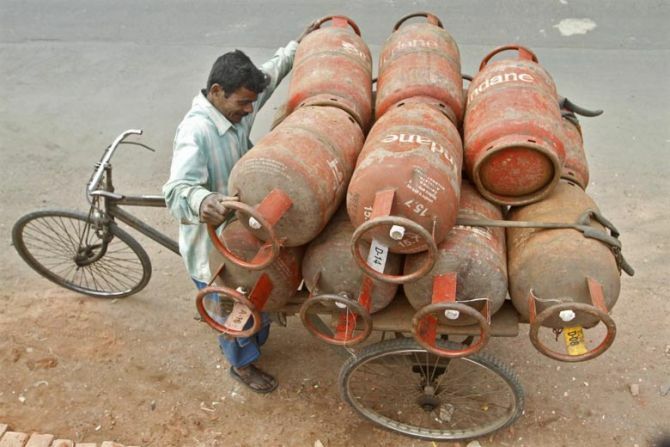 The Centre and the Congress-ruled Karnataka are engaged in a tussle over free cooking gas connections to the poor, with the state recently launching a scheme similar to the Narendra Modi government’s flagship Pradhan Mantri Ujjwala Yojana (PMUY). The Siddaramaiah-led government’s move to introduce the Mukhyamantri Anila Bhagya Yojana (MMAY) comes months before the state is scheduled to go to the polls. According to sources close to the development, the Ministry of Petroleum and Natural Gas has written four letters to the state government in the past two months, seeking clarifications and asking for a joint scheme, which the state has rejected. The Centre is of the view that such a scheme should not be routed through LPG dealers but oil marketing companies such as Indian Oil Corporation (IOC), Hindustan Petroleum Corporation (HPCL) and Bharat Petroleum Corporation (BPCL) for transferring the benefit. Tabling the state Budget last month, Siddaramaiah had announced the MMAY, seeking to provide a free gas connection with a twin-burner stove and two annual refills each to 3 million beneficiaries with an expenditure of Rs 1,350 crore. This scheme will compete with the PMUY, which has been the high point of Modi’s election campaign in states since its launch in May 2016. Under the central scheme, the number of beneficiaries in Karnataka is 880,000. “The state is implementing the scheme by involving the labour and food supplies departments. "The state has gone back on the earlier understanding with the Centre and the Union minister of state for food and civil supplies. "We have told them that their effort is not in line with the established procedure and, hence, is not having the concurrence of the petroleum ministry. We had asked them to implement this through OMCs,” said a person close to the development. While the Centre is providing Rs 1,600 each to a family under the PMUY, Karnataka’s MMAY allots Rs 2,154 to distributors and Rs 550 to beneficiaries for a second refill. “Had they co-partnered the Centre, the state exchequer could have saved Rs 1,350 crore, and it would have been a more orderly scheme,” said the person quoted above. The saving could come if the central subsidy is clubbed with that of the state, instead of it coming in addition to the state subsidy. The petroleum ministry in its letters had highlighted that the states like Chhattisgarh, Jharkhand, Assam, Punjab, and Haryana are also running such schemes but in participation with the Centre. The Centre and various state governments had been giving subsidy for LPG even prior to the launch of the PMUY. The Rajiv Gandhi Gramin LPG Vitaran (RGGLV) scheme was launched by the UPA government in 2009, to cover households in rural areas. The flaws that the Centre is highlighting also include the purchasing of stoves directly by distributors and also confusion, as OMCs are the nodal point for de-duplication. The state is providing connections to the existing beneficiaries of the Antyodaya Anna Yojana (AAY) and the Priority Household (PHH) scheme, while the Centre targets women of the below poverty line families based on the Socio-Economic Caste Census (SECC) of 2011. “The state’s scheme is also applicable to men. As OMCs are allocating cooking gas, a scheme bringing in labour inspectors and food inspectors may lead to chaos. However, such consumers may also get subsidy if compliant to existing norms,” a source said. Chandra Prakash, general secretary, All India LPG Distributors Federation, said: “The state government has already launched the scheme in rural areas through dealers.